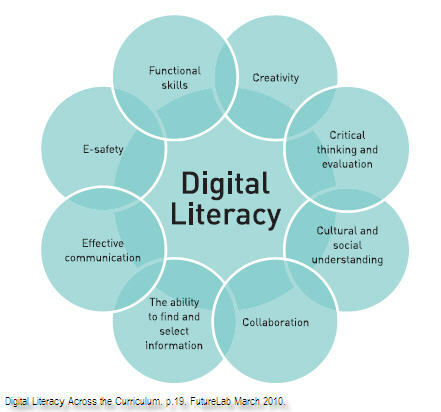 What is Digital Literacy ? Knowing how succeed in the digital environment? Being good with technology? The ability to find information fast? Having a wide social network? Or a combination of skills that you need to learn? - What you need to learn to do ... to learn. Just like a cook knows what tools and techniques they need to make a cake, the digital learner needs skills and tools to learn. There are many definitions of Digital Literacy, most view it as an underlying set of skills that supports learning; allowing people to communicate, collaborate, explore and share their creativity. This FutureLab diagram shows how Digital Literacy can be viewed as a range of components. However some definitions of Digital literacy view it as a hierarchy, or steps on a journey, where learners gain incremental skills and gradually becoming gradually more proficient as digital learners. Most definitions include the ability to use digital media with a critical understanding of the information they find and an ability to evaluate it's quality. In addition to critical consumption of digital material, users may then use and adapt and share it with other learners. Understanding issues like safety, copyright, citizenship and networking. Some learners may also create their own material, which they share with others via learning networks or platforms or on social media.